1) Cook, an American bistro located in Newton, is welcoming multi-media journalist Janet Wu as part of its continuing “Cook for Charity” celebrity chef series. On Thursday, October 6, Janet will trade in her microphone and get cooking with Executive Chef/Owner Paul Turano, where they’ll be serving up flatbreads to benefit the Ed Walsh Foundation. In addition to Cook’s signature menu items, Janet and co. will be serving up “The Edzo” special, a house-made flatbread topped with pepperoni, roasted peppers, San Marzano tomatoes and mozzarella. 100% of sales from each $16 “The Edzo” flatbread, affectionately named after Ed Walsh himself, will be donated to the foundation. Named for Lieutenant Ed Walsh of the Boston Fire Department, the Ed Walsh Foundation was established to keep Ed's spirit alive by giving back to the community where he lived and worked. The Foundation's mission is to help Boston area children and families in need. In addition to lending a hand to local families coping with tragedy, death or illness, the Foundation also supports youth sports, after school programs and organizations like the YMCA and Franciscan Children's. Janet Wu will be joining the Ed Walsh Foundation for this special event. Janet is a multi-media journalist known locally for her many years as an anchor/reporter for Boston's NBC station. She currently contributes health reports for two networks and is an adjunct professor at Emerson College. A frequent Op-Ed contributor to The Boston Globe, her work has also been published in The New York Times, The Boston Herald, and several anthologies, including The "Norton Sampler of Essays," one of the most widely read college textbooks. She graduated from Yale with a dual major in Philosophy and Psychology and earned a master's degree in Journalism and International Affairs at Columbia University. She was named The Girls Scouts of New England 2015 Leading Woman of the Year and selected as a fall 2016 TEDX speaker. This night of cooking is one of several celebrity chef events at Cook, all of which raise money and awareness about a charity chosen by the specific celebrity chef of the evening. The regular menu will also be available on the night. WHEN: Thursday, October 6. Appearance by Janet Wu from 6:00PM – 8:00PM. Dinner served from 4:30PM to 10:00PM. RSVP: Reservations recommended by calling 617-964-2665. 2) Margaritas, the Mexican-inspired restaurant known for its namesake cocktails freshly made each and every day with their housemade “Squeeze,” spices up their fall cocktail game with seasonal-twists on their fan-favorites. Whiskey-Rita: The house favorite margarita -- made with Jack Daniels instead of tequila. Hand-shaken with home-made Squeeze and triple sec, topped off with a float of Grand Marnier. Pumpkin Sangria: Sangria isn’t just for summer. Enjoy white (sauvignon blanc) or red (merlot), combined with apple and cranberry juices, Absolut Vanilla and pumpkin puree. All the flavors of fall in one sip. Pomegranate Cinnamon Proseccorita: Margaritas takes their Proseccorita to the next level by mixing Cuervo Cinge, triple sec, pomegranate juice and Squeeze, topped with a festive mini split of prosecco. 3) On Tuesday, October 4, Besito Mexican in the Burlington Mall and the Shops at Chestnut Hill, will say “Olé” to National Taco Day with a “Buy One, Get One” taco deal offered during lunch and dinner hours (dine-in only) at both locations, featuring the restaurant’s “Street Taco” creations. Yes, you read that right, this year it’s officially National #TacoTuesday! National Taco Day presents an exciting opportunity for guests to experience the Mexican flavors and artful presentations that have become synonymous with the Besito name, via a wallet-friendly, weeknight dining experience. Served with three ample-sized tacos during lunch, and two during dinner, Besito’s “Street Tacos” are layered with vibrant, fresh and authentic ingredients, and available in four unique combinations, including Street Tacos de Pollo, a delicious blend of Chicken a la Plancha, salsa de guajillo, salsa chipotle crema, nopales salad and queso fresco; Street Tacos de Carne Asada, a flavorful mixture of marinated-grilled skirt steak, scallions, and salsa verde cruda; Street Tacos de Camarones, featuring crispy shrimp, salsa chipotle crema, salsa molcajete, and queso fresco; and Street Tacos de Pescado, a guest favorite boasting crispy fish, salsa chipotle crema, and salsa molcajete. COST: Purchase one of Besito Mexican’s “Street Taco” combinations ranging in price from $8.95 to $11.95 and receive a second of equal or lesser value free. Offer does not apply to "appy hour” “Street Tacos” and cannot be combined with any other offers or promotions. MORE INFO: Available for “dine-in” guests only. Valid only during lunch and dinner hours on Tuesday, October 4 at Besito Mexican locations in Burlington and Chestnut Hill. 4) The 7th annual Raise Your Glass for Jimmy beer and wine tasting fundraiser will benefit the Jimmy Fund and Dana-Farber Cancer Institute. On Wednesday, October 19, at 6:30 p.m., guests will experience more than 30 beverage selections from five wineries and five breweries, including a variety of craft beers and local brands. The event will also feature seasonal hors d’oeuvres and desserts from Capital Grille, Strega, Del Friscos, Row 34, and Fleming’s, among others. Guests will enjoy live band entertainme and attendees can also participate in a silent auction. COST: Tickets cost $50 per person. 6) Chef/Owner Michael Schlow, The Tico Boston team, and the Slater Foundation invite guests to join them at Tico for a charitable night of Halloween revelry. On Saturday, October 29, at 8:30pm., Tico and the Slater Foundation will be hosting its annual Halloween for Hope to benefit the Ellie Fund and those affected by breast cancer. The Alice in Wonderland –themed party will include a cocktail hour, a DJ, dancing, passed bites, a dessert bar, airbrush tattoos, and a costume contest with cash prizes. Each guest will also receive three complimentary beverage tickets for Tito’s cocktails, and select beers & wines courtesy of United Liquors. Based in Needham, the Ellie Fund works tirelessly to provide essential support services for breast cancer patients to ease the stresses of everyday life, allowing the focus to be on family, recovery and healing. The Ellie Fund provides critical support services including transportation to medical appointments, childcare, housekeeping, groceries and nutritious prepared/delivered meals free of charge helps to relieve patients’ burden while in treatment. 7) The Filmark Hospitality Group and the Italian Consulate invite guests to join them for a day of dining and drinking to benefit the Italian regions devestated by the recent earthquake. Participating restaurants include Lucia Ristorante, Ducali, Filippo Ristorante, Capo, Scopa, Rino’s Place, Massimino’s Cucina Italiana, and many more. On Sunday, October 23, from 1pm-4pm, at the DCR Steriti Rink on the North End Waterfront, Boston Stands with Italy will bring together Boston’s best Italian restaurants to raise funds for the regions of Central Italy most affected by the recent earthquake. Guests will enjoy sips and bites from the Umbria, Marche, Abruzzo and Lazio regions of Italy prepared by over 30 local Italian restaurant and distributors. In addition to food and wine offerings, the event will also feature a high-end silent auction and entertainment provided by local organizations. Tickets cost $60 and can be purchased in advance at https://www.eventbrite.com/e/boston-stands-with-italy-tickets-28161067511. For more information, please visit http://www.bostonstandswithitaly.org. 8)On Wednesday, October 5, starting at 6:30pm, The Palm Boston welcomes guests and wine lovers to a special Torres Wine Dinner featuring paired selections with a five-course tapas tasting menu crafted by The Palm Boston Executive Chef Karen Mitchell. Guests will be led on a culinary adventure featuring Spanish wine pairings. Similar to The Palm, Bodegas Torres has a rich history of family ownership and traditions while pushing the envelope forward in innovation. Torres is widely recognized for their commitment to sustainability and social responsibility. For this one-night only event, The Palm Boston has created a distinctive tapas menu created to complement the nuances of flavors from a selection of Torres award-winning wines including Verdeo Verdejo, Pazo das Bruxas Albariño, Celeste Crianza and Salmos. COST: The Torres Wine Dinner is $120 per person ($95 for 837 Club Members) and includes a reception, 5-Course Dinner and pairings (exclusive of tax and service charge). Rant: The "Best" Seafood Restaurant? What is the best seafood restaurant on the South Shore? Recently, the Atlantic Kitchen made that claim on their Facebook page, stating they were "The best family run seafood restaurant on the South Shore." To their credit, they have removed that statement from their Facebook page. The problem was that the restaurant wasn't even open yet, and may not open until October or November. How can you make such a claim when you aren't even open? Declaring yourself to be the "best" restaurant in any category is arrogant. Of course you are biased, and aren't making an objective statement. If you want to prove the quality of your restaurant, then let your customers determine how you compare to other similar restaurants. They are the ones who make the ultimate decision, voting with their wallets and pocketbooks. I've seen other restaurants claiming to be the "Best," such as various roast beef spots, and have even seen one claiming to be the best roast beef spot in the world! Why do these restaurants make such outrageous claims? Is there anyone who believes such claims? I just can't see the average person seeing such a claim and believing it. I can't see the average person choosing a restaurant because they see such a "best" sign outside of it. The customers should all know that such "best" signs are simply puffery. And unnecessary puffery. Restaurants, drop the claims that you are the "best." Your efforts would be better invested in providing quality food and service, letting word of mouth and positive reviews to indicate the quality level of your restaurant. If anything, calling yourself the "best" could have negative repercussions, causing some potential customers to turn away from your perceived arrogance. The Nara Period (710-794), reflecting that the capital of Japan was now the city of Heijō-kyō (modern day Nara), offered numerous documented references to Sake, establishing basic information we know about the history of Sake. Prior to this period, there was a lengthy tradition of oral history but also some written documents, such as the Teiki, but those documents are lost to us. The oldest existing book in Japan, composed around 711-712, is the Kojiki, “Record of Ancient Matters,” which presents both history and myth. It is said to have been written by Ō no Yasumaro at the request of Empress Gemmei. It contains numerous references to Sake, including tying it into a number of ancient myths. For example, the text mentions that “The intoxicating liquor called sake was known in Japan during the mythical period…” which is indicative of a belief in the lengthy history of Sake within Japan. The Koijiki relates the myth of Susanoo, the Shinto storm god, whose rebellion led to his banishment to Japan. While traveling through the Shimane Prefecture, Susanoo encountered an elderly couple with their young daughter. The couple claimed that they once had eight daughters but Yamata no Orochi, a terrible eight-headed dragon, had devoured one of their daughters each year. Susanoo stated he would help them if they granted him the hand of their daughter. They agreed and Susanoo enacted his plan to destroy the dragon. First, Susanoo had a large fence constructed, with eight gates, and placed a table in front of each gate. Second, he brewed a special Sake, an "eight-fold" or "eight-times brewed" Sake called Yashiori no Sake. Then, Susanoo waited for the dragon to come, hoping his trap would succeed. The huge supernatural beast eventually showed up, and each head drank one of the vats of Sake. The dragon became intoxicated and then fell asleep. At that moment, Susanoo then took his sword and played the mighty sleeping dragon. There are a number of other Sake references too in the Kojiki. There is the term “Sakabe” which rougly translates as "liquor tribe," referencing a family that brewed Sake for Imperial dinners and feasts. There is more specifically a reference, Uda no Sakabe, the "liquor tribe of Uda." There is another reference to a “waiting-liquor.” In addition, you'll find the term, Machi-sake, which refers to Sake that is produced for an absent friend by those who are awaiting his return. Machi-Sake is later mentioned again in a number of poems in the Man'yōshū. Another fascinating passage seems to indicate potential Korean involvement in the existence of Sake in Japan. During the rule of Emperor O-Jin, thought to be around the late 3rd or early 4th centuries, a Korean man, known as Nim-pan or Susukori, visited the Imperial Court of Japan. Susukori allegedly came from Kudara, an ancient kingdom of Korea. Susukori produced Sake for the Emperor, who was thoroughly impressed with the results, stating: "I have become intoxicated with the august liquor distilled by Susukori. I have become intoxicated with the soothing liquor, with the smiling liquor." It is certainly possible that the Japanese learned about Sake brewing from Korea. During the Nara period, around 713, the Empress Gemmei ordered each provincial government to submit an extensive report on agricultural, geographical, and historical information as well as the myths and legends of the area. These reports became known as Fudoki, and those written during the Nara period were more specifically known as Kofudoki, “Old-Fudoki.” The Kofudoki were compiled over a roughly twenty-year period, and some reference Sake. Unfortunately, we only have fragmentary information about some of these Kofudoki so are likely missing a number of Sake references within those documents. The use of koji-kin, a mold which breaks down the starches in rice into sugar so the yeast can turn it into alcohol, might have originated in China but there is one theory, supported by this passage, that it may have developed independently in Japan. At the very least, we can see with this reference that koji-kin mold has been used to brew Sake at this time period. It is thought that the earliest form of koji was possibly made by mixing rice with water, kneading it and forming it into ball, before letting it sit for several weeks. Compiled in 720, the Nihon Shoki ("Chronicles of Japan"), also known as also the Nihongi, is the second oldest book in Japan and consists of thirty chapters. It also contain numerous Sake references, some similar to those found in the Kojiki. For example, it also relates the tale of Susanoo and Yamata no Orochi. However, it also adds additional references not found in the Kojiki, such as references to Sukuna-bikona, a dwarf-sized god who is also known as Kushi no Kami, and it stated to be the inventor of medicine and the creator of Sake. “On this day, Ikuhi, in person, presented to the Emperor sacred sake, with a song, as follows:— This sacred sake Is not my sacred sake: Tis sacred sake brewed By Oho-mono-nushi, Of Yamato, How long ago! How long ago!" With these references, we can note two different types of Sake, sweet Sake and sacred Sake, though it isn’t clear whether sacred Sake is also sweet or not. Sacred Sake was made from rice grown on temple grounds and it was customary to offer it to foreign ambassadors. There is also a passage in the Nihongi, referencing 193 AD, about a great Sake master, Oho-saka-nushi, an ancestor of the Miyakko of Kukumada. During Kami-ari-zuki, the "Month of the Gods," all of the gods once gathered together at Izumi Taisha to feast and drink. They brewed Sake and spent about six months drinking and eating, engaging in what is said to be called sakamizuki, which is also allegedly where the area received its name, Saka. The area where this allegedly occurred is now known as Kozakai-cho, and there is the Saka Shrine located there, and which has been in existence for over 1300 years. The shrine is also known as the Matsuo Shrine, which is the name used for shrines throughout the country that enshrine the deity of sake brewing, Kusu-no-kami. This passage is intriguing as it indicates Sake being used in a magical ritual, as an oracle. Sake has long been closely involved in religious ceremonies so it isn't a stretch at all to see it also being used in a oracular fashion. Around 759, the Man'yōshū (“Collection of Ten Thousand Leaves”) was compiled, the oldest Japanese collection of poetry. Its 4,500 poems were created from 347 AD-759 AD, and the collection was divided into twenty books, though the poems weren’t organized by topic or even chronologically. Most of the poems, about 4200, are tanka, short poems, while another 265 are choka, long poems. A number of these poems referenced Sake. One of the famous poets in this book is Ōtomo no Tabito, (665‐731), a military man in the Nara Court aristocracy and an influential poet. Within the Man'yōshū, you will find a number of his tanka, praising Sake. A bowl of raw Sake." "Excellently said, those words of the great wise man of antiquity who bestowed upon sake the appellation of sage." "Those seven wise men of the past---what they too wanted, it seems, was Sake." "I don’t know how to say it, what to do about it—the noblest of all, it seems, is Sake." "Rather than be a so-so human being, I’d like to be a Sake jar and get steeped in Sake." "A priceless treasure it may be, but how can it be better than a bowl of raw Sake?" "A gem that gleams at night, it may be, but how can it compare to drinking Sake and opening your heart?" Another poet in the Man'yōshū is Okura Yamanoe (660‐773? ), a contemporary of Ōtomo Tabito, who composed a long poem, the “Dialogue on Poverty.” It presented images of suffering, including people who had to drink the Sake dregs, which only the poorest people had to drink. 1) Join Executive Chef Tony Susi, Bar Manager Kevin Mabry, and the team at Capo as they host special guest Lia Tolaini-Banville from Banville + Jones Wine Company for an exclusive Banville + Jones Wine Dinner. On Thursday, September 22, from 6:30pm-8:30pm, Capo is serving up a specially crafted menu that remains true to their classic, fine Italian dishes with paired wines from the Banville + Jones wine company. The dinner will be the restaurant’s first Italian wine dinner. For the special inaugural wine dinner, Capo is welcoming special guest Lia Tolaini-Banville from Banville + Jones Wine Company to showcase the wines and walk guests through an Italian culinary adventure. Banville + Jones’ mission is to provide the best quality of wine to their customers. Achieving this means they are committed and dedicated to serving wines that are, from vine to bottle, the best quality and price. 2) Celebrate National Taco Day on Tuesday, October 4th by heading to Taco Tuesdays at Temazcal Tequila Cantina’s location at MarketStreet in Lynnfield. On Tuesdays each week, Temazcal offers any of the specialty tacos on their menu for half the price from 11:00am-6:00pm, with options that include Vegetable Tacos, Lettuce Wrap Ahi Tuna Tacos, Grilled Chicken Tacos, Tacos Mechados and Asada Skirt Steak Tacos. All tacos come with a side of rice and refried beans. Wash it all down with one (or two) of Temazcal’s signature margaritas like the jalapeno-infused En Fuego or, if you like something on the sweeter side, try the Fresca. 3) TAMO Bistro & Bar at the Seaport Hotel has debuted it’s fall drink menu this week which includes new seasonal cocktails, beers and wines. Highlights off the menu include two new inventive Fish Bowl offerings: The Voodoo Bowl and The S’mores Bowl as well as The Harvest Crush Sangria, a cold brew coffee cocktail and a new Banana Bread Beer. Pour yourself an ochoko of Sake, and get ready to delve into the past, to seek out the Nihonshu no kigen, the origin of Sake. The history of Sake is a fascinating tale and I’m sure there will be plenty that will delight and surprise you. However, we need to begin with a caveat, that this history is far from settled, and much is still unknown. We can only speculate at points, using the best evidence we possess. In addition, some of the sources concerning Sake history are only in Japanese and haven’t yet been translated into English. As such, my own researches are limited as I cannot read Japanese and online translation programs are insufficient for my purposes, especially in translating books which are not online. Please also be advised that this is a work in progress and I will be updated, revising and expanding this article as my researches continue. Archaeological evidence appears to indicate that Sake originated in China during the Neolithic period, at least as far back as 4800 B.C. That would mean that Sake is approximately 7000 years old. When did Sake come to Japan? That is an unsettled question and there is even the possibility that Japan invented Sake independently of China. In Japan, pottery shards from the Jomon Period (c. 12,000 B.C. — c. 300 B.C.) bear evidence of alcoholic fermentation, though probably involving fruit. That makes sense as it's believed that rice farming in Japan didn’t originate until the early Yayoi Period (400/300 B.C.-250AD). Sake brewing likely wouldn’t have been conducted prior to that time, unless they were importing rice from other countries. Thus, the presence of Sake in Japan might have begun about 2000 or so years ago. As Japan borrowed a number of elements from China, it seems likely they also learned of Sake brewing through them, though there is another theory that Koreans may have transmitted information on Sake brewing to the Japanese. More about that theory later. The earliest versions of Sake were more like food than drink. It was commonly a gruel-like substance, with a low alcohol content, and which was even eaten with chopstick-like utensils rather than drank. It was also, at least initially, consumed more for its nutritional value rather than the alcohol. There is indication that some early farmers, possibly originating with the Ainu people, may have produced Sake by chewing rice and then spitting it into a bucket where natural, airborne yeasts would ferment it into alcohol. This was called Kuchikami no Sake (“chewing in the mouth Sake”). The enzymes in the spit would break down the starch molecules in the rice into sugars. There is also a legend of Bijinshu, ("beautiful women Sake”), where only virgins were allowed to chew the rice for that Sake. Some question whether Kuchikami no Sake actually occurred or not. An old term for the act of brewing Sake is kamosu (which translates as “brew”), but the term is derived from the word kamisu (meaning “to chew”). That may be some evidence for the existence of Kuchikami no Sake. In addition, there is allegedly some documentary proof of Kuchikami no Sake in the Osumi no Kuni Fudoki (created in the early 8th century) and the Akichojitsuroku ("Seasonal Court Practical Record" from 1479 AD). The first written reference, from a foreign country, concerning the Japanese was in a Chinese work, Sanguozhi, "The Records of the Three Kingdoms," that was published in the third century. The book is an official and authoritative historical work, covering the history of the later Eastern Han dynasty (c. 184–220 AD) and the Three Kingdoms period (220–280 AD). It is said to have been written by Chen Shou, a governmental scribe and secretary, and contains 65 volumes, broken down into three main books including the Book of Wei, Book of Shu, and Book of Wu. Volume 30 of the Book of Wei is known as Gishiwajinden, “An Account of the Wa,” where Wa refers to the country of Japan. Some Chinese envoys traveled to Wa and described their experiences. They visited the kingdom of Yamataikoku, which was ruled by Queen Himiko, however the exact location of this kingdom is still unknown and much debated. There is also a reference that the Queen sent an envoy back to China. Queen Himiko, who was also a shaman, became ruler after a lengthy time of war and chaos. Within the Gishiwajinden, you’ll find only a couple brief references to Sake though they seem to indicate that the Japanese were heavy drinkers. One of the main references notes Japanese drinking during a funerary celebration, “While the chief mourner cries aloud, the other people will sing and dance, as well as drink rice wine.” There is another separate reference, that the people of Japan “… love rice wine by nature.” There isn’t any description of how Sake was produced, but it seemed to indicate that it was at least part of their religious practices. Near the end of the Asuka Period (538-710), Sake brewing would become part of the government, as well as confined to the elite. In 697, Emperor Mommu, aged fifteen, began his reign, which lasted until 707. From the Imperial Palace in Asuka (located in what is now the Nara Prefecture), Mommu established a centralized government and instituted a political system based on the ritsuryō codes. The ritsuryō, intended to reflect the Chinese political system based on Confucianism and Chinese Legalism, covered both criminal and civil law. The beginnings of this system in Japan extend back to the Taika reforms of 645 and various expansions and revisions would occur over the next century. In 689, there were 8 Ministries (shô), separated into 4 under the Controlling Board of the Left (sabenkan) and 4 under the Controlling Board of the Right (ubenkan). Under the Controlling Board of the Right, was the Kunaishô, the Ministry of the Sovereign’s Household, and this ministry included the Zōshu no Tsukasa (also referred to as the Sake no Tsukasa), the Office of Sake Brewing. The chief of this office was known as the Sake no Kami. Since the Imperial Court and the nobles frequently held banquets, this new position was seen as an important post and was only held by high ranked officials. Sake was now brewed only for the Imperial Court and it was prohibited to commoners. It should be noted that all of the various offices were supposed to employ scribes to keep records though practically, they didn’t happen at many of the various offices. Initially, there don’t appear to have been any scribes attached to the Office of Sake Brewing, but eventually, maybe a hundred years later or so, they acquired the services of four scribes for record-keeping. By 701, the brewing system had become systematized by the Imperial Court and Sake brewing technology progressed dramatically. How did the public handle their prohibition from consuming? The ban could not be strictly enforced and home brewing was common, despite it being illegal. One of the best elements of autumn is enjoying a fresh and warm Cider Donut. Though they can be found at some supermarkets, small food shops, and even restaurants, it is hard to beat buying them at a local apple orchard where they can use their own fresh picked apples. Yesterday, I stopped at my favorite spot, Russell Orchards in Ipswich, and picked up a dozen ($9.50). At Russell Orchards, they make their donuts from scratch, using their own special recipe as well as their own apples. During this time, you often can see their staff making the donuts, dropping the dough into the fryer and then seeing the fried donuts moving down a conveyor belt where they will be bagged. It is said that Russell Orchards sells approximately 200,000 cider donuts each year and it is easy to understand why. For me, their donuts (pictured above) are soft and moist, with a slightly crusty exterior, and the right balance of apple and spice flavors. And when they are warm, it's hard not to eat several on your way from the cash register to your car. I'm glad that I don't live closer or I'd stop by more frequently and devour far too many cider donuts. However, not all cider donuts are like that. There are basically two types of cider donuts, the soft ones like at Russell, and heavier, more cakey cider donuts that you can find at a number of other farms. It is a battle as to which is the best, and I am firmly on the side of the lighter style. With the heavier style, they tend to be more dry, less moist, and you need to have a drink with them to help wash down the dry donut. They also feel heavier in your stomach so that you rarely want more than one. Even warm, they still feel heavy and dry, and just don't satisfy like the lighter style. Why would anyone prefer the heavier style? If you prefer the heavier, more cakey cider donuts, please tell me why. 1) Chef/Owner Michael Schlow and the Doretta Taverna team invite guests to join them in celebrating their first birthday! On Wednesday, September 28, from 4pm-7pm, Doretta Taverna and Raw Bar will be celebrating its first birthday. To mark the occasion, Doretta will be hosting a special Wine Wednesday Birthday Banger. Guests can enjoy $1 oysters, wine tastings, champagne, mezze bites, sparklers, and more. Tickets cost $39 and can be purchased at https://www.eventbrite.com/e/wine-wednesday-birthday-banger-tickets-27579163019. For more information, please call (617) 422-0008. 2) Newly opened Brassica Kitchen + Cafe co-owners/co-chefs Jeremy Kean and Phil Kruta are pleased to announce that they are now offering Sunday Brunch from 10 a.m. to 3 pm. Located in a former luncheonette in Jamaica Plain across from the Forest Hills MBTA station, Brassica Kitchen + Cafe serves fun French-American comfort fare, using locally grown, seasonal ingredients in unexpected ways with delicious results. Chicken and Waffles drizzled in hot sauce and maple syrup. Belgian Waffles served with raspberry compote and whipped maple butter. Banana Bread French Toast with banana flambé. Salmon Boccadillo served with a fried egg and salsa verde on brioche. Egg in a Hole served with bacon and home fries. Biscuits and Gravy served with poached eggs. Bloody Meeri: Vodka, beet kvass and trumpet worcestershire. Mick the Miller: Drip brewed Punt e Mes, fresh grapefruit juice, tarragon and salt. Pimms Cup: Pimms No. 1, lemon, cucumber and ginger beer. Moto GP Mimosa: Aperol, fresh orange juice, cava. A series of coffee, tea and espresso drinks will also be offered on this new unique menu. 3) Bistro 5, in Medford, will be offering their 11th Annual Heirloom Tomato Menu from September 14th-24th. Every year Chef Vittorio Ettore and team put in countless hours trying to come up with unique ways to incorporate this seasonal favorite into 5 different dishes, including a dessert. This menu is a highlight of the year and I can't recommend it enough. 4) Gordon Wilcox, CEO of Wilcox Hospitality Group; Dr. Jay Austen, Jr., Chief of Plastic and Reconstructive Surgery and Chief of Division of Burn Surgery at Mass General Hospital; Brian Poe, chef & co-owner of The Tip Tap Room. On October 3, at 6pm, The Tip Tap Room owners Brian Poe and Gordon Wilcox will host the 3rd annual “Chefs for Clefts” fundraiser at their Beacon Hill hotspot to benefit Massachusetts General Hospital’s Global Surgical Initiative. Funds raised from the charitable fête will directly assist Dr. Jay Austen’s (Chief of Plastic and Reconstructive Surgery and Chief of Division of Burn Surgery at MGH) “Cartagena Surgical Missions” that support children with facial deformities and cleft lips as well as burn victims in Colombia. To date, the Cartagena Surgical Mission has served more than 700 children who otherwise would have no access to care. This festive “Night in Colombia” themed event will kick-off with South American music as well as complimentary Colombian-inspired cocktails and passed hors d'oeuvres, as prepared by Brian Poe. Brian Poe (The Tip Tap Room; Poe’s Kitchen at the Rattlesnake; Bukowski Tavern – Cambridge) and chef friends Andy Husbands (Tremont 647; Smoke Shop), Jose Duarte (Taranta), Louie DiBaccari (Tavern Road), Lydia Shire (Scampo) and Rodney Murillo (Davio’s Northern Italian Steakhouse; Davio’s Cucina) – among others – each graciously have donated a three-course “dinner for ten” with wine pairings at their respective restaurants which will be up for bid during the live auction. Supporters also will have the opportunity to mix and mingle with some the city’s top culinary luminaries who will be present at this evening with a cause. MORE INFO: To purchase tickets, please visit: https://www.eventbrite.com/e/chefs-for-clefts-tickets-27224578447. Additional donations for Massachusetts General Hospital’s Global Surgical Initiative will be accepted onsite or via EventBrite. 5) Start with a made in-house hard-shell taco, bigger than your face. Stuff it with all of the fresh-made Mexican fixings from Margaritas Mexican Restaurants scratch-kitchen: seasoned chicken, taco beef, pork carnitas, bacon, lettuce, refried beans, Mexican rice, salsa fresca, cheese and queso sauce. Top it with hacienda and picante sauce, crema and pickled jalapeños and you’ve got the Taco Gigante. Each foot-long, two-pound Taco Gigante is sold for $12.99, with $2.00 of every purchase donated to Team IMPACT. Team IMPACT’s mission is to improve the quality of life for children facing life-threatening and chronic illnesses through the power of team. Team IMPACT has matched 1,000 children at over 400 colleges and universities in 45 states, reflecting Margaritas values of community, celebration of life and teamwork. WHERE: All participating Margaritas Mexican Restaurants in MA, ME, CT and NH. WHEN: September 27 – October 31, 2016; available during regular kitchen hours. And note that October 4 is National Taco Day! Quite A Milestone: 4000 Blog Posts! This is my 4000th blog post! That averages out to about 1 blog post per day for nearly 11 years and in November, I will have been blogging for eleven years. When I started out blogging, which now seems so long ago, I never imagined I would have come so far. There certainly have been days that I haven't posted but there have also been other days when I posted multiple times. Call me longwinded, dedicated, obsessed, passionate, or crazy. There is probably a bit of truth in all of that, as well as more. Writing in in my blood, simply a significant part of who I am, and I wouldn't be happy unless I were writing. I still find immense enjoyment in writing so I don't dread getting up in the morning and starting to put words together. It is why I have also written three novels and numerous short stories. I have a deep passion for writing, both fiction and nonfiction. Over the course of the past eleven years, I've seen many food/drink blogs come and go. A significant number of people aren't able to continue a blog for more than a year at best. It can be a lot of work, and certainly takes drive and dedication. If it is only a hobby, then many other matters can take precedence. However, I know some other blogs which have stood the test of time, which have lasted for many years too. And those people deserve many kudos for their passion and drive as well. One of the keys to my longevity is that I never had a narrow focus on my blog, though there are definitely subjects which capture more of my attention than others, such as Sake, Sherry and Portuguese Wine. I have had the freedom to write about any food or drink topic which grabs my attention. I love that diversity, the ability to expand my palate in so many directions. It has also allowed me to learn about so many different foods and drinks, restaurants and wineries, food markets and distilleries. As I don't limit my explorations, I'll never run out of ideas to write about. During the last 11 years, I have learned so much, and then shared it with my readers. For example, this year, I learned about Baijiu, a fascinating Chinese spirit which is the most popular spirit in the world. I also expanded my knowledge of Greek spirits at Committee, a killer Greek restaurant in the Fan Pier district. I went deeper into the world of Mezcal, explored an innovative and local hydroponic lettuce farm, checked out the drinks industry in Vermont, went deep into the Manhattan cocktail, and much more. It's a very good feeling when I receive feedback from my readers that they have enjoyed one of my recommendations, whether it is a restaurant or bottle of wine. For example, during the past year, I've often recommended Ciao Pizza & Pasta, in Chelsea, and I haven't heard a negative word from anyone who has gone there. In fact, they usually rave about it, returning again and again, and telling their friends about it. It's also rewarding when I receive feedback that one of my articles, often my Rants, has gotten my readers to think about matters they hadn't give any thought to before. Out of my 4000 posts, I have some favorites, those posts which I am especially proud of for various reasons. At the top, I am proudest of my article, An Expanded History of Sake Brewing in the U.S., which involved lots of research, including searching through old newspaper archives. It presented an intriguing history which surprised numerous people and changed some of their previous beliefs. I'm also very pleased with my multi-part histories of Port, Sherry, and Champagne. One of my most popular posts, and another favorite of mine, is The Science of Sake & Food Pairings, discussing all the reasons why Sake pairs with all types of food. Finally, my most popular post, as well as the most controversial, is Rant: Alton Brown, I Call You Out! That stirred up plenty of emotions, both positive and negative. I've met so many interesting people over these past 11 years, some who have become good friends. And all of these people, in their own ways, have helped teach me as well. I've tried to share with my readers information about these people and their businesses, interests, and passions. In my own small way, I've tried to highlight the diversity of some of these people, in ways like Wine, Women & The Internet, showcasing women who write about wine, and Celebrating Local Diversity: People of Color Blogging About Food & Drink. I look forward to continuing my blog for years to come, to continuing to write about food and drink, to exploring all the world has to offer. Thank you to everyone who has contributed in anyway to all that I have done. There are far too many people for me to name them all individually. And there will be even more people who will assist me, in a myriad of ways, in the future. Time to crack open a great bottle of wine and celebrate! Drink & dine with passion! Almost seven years ago, back in December 2009, I wrote an article, Sake in Norway, about Nøgne Ø, a well-known craft beer brewery in Norway which wanted to also become a Sake brewer. They were poised to be the first Sake brewery in Europe and I was excited to see what developed. Since then, Nøgne Ø accomplished their objective, becoming the first Sake brewery in Europe, and now produces four different Sakes, from a Yamahai Junmai to a Sparkling Sake. Even better, their Sake is now available in Massachusetts, through the Shelton Brothers Inc., which is primarily an importer of beer. Redstone Liquors in Stoneham is currently carrying the Nøgne Ø Yamahai Junmai ($19.99/350ml), and they hope to carry the rest of the Nøgne Ø Sake portfolio in the near future. I bought several bottles, eager to sample this Norwegian Sake. The name "Nøgne Ø" translates as "naked island" which is "a poetic term used by Henrik Ibsen to describe any of the countless stark, barren outcroppings that are visible in the rough sea off Norway's southern coast." The brewery also has a subtitle, Det Kompromissløse Bryggeri, or “The Uncompromising Brewery.” They make more than 30 different types of ales, and, in addition, have made numerous guest brews & collaborations with other breweries from all over the world. Nøgne Ø desires to create "bold, rich, flavourful Sakes" and because of such, all their Sakes are made using the Yamahai process. This is an older method of production in which commercial lactic acid is not added to the fermentation, allowing lactic acid from the air to naturally develop within the mix. It takes longer for this type of Sake to ferment, and it is riskier, with a chance of stray bacteria ruining the fermentation. Sake made by this process often tends to be more complex, earthy and gamey. I am a huge fan of Kimoto/Yamahai Sake, so I was especially interested in checking out Nøgne Ø Sake. Their Sakes are also made from Ginpu, a type of Sake rice that has been imported from Hokkaido, Japan. This rice type was officially registered in 2002, having been developed by the Hokkaido Central Agricultural Experiment Station. It is rare for any Sake brewery outside of Japan to use a sakamai, a Sake rice, from Japan in their brewery. Even the U.S. Sake breweries which are using Yamadanishiki, also a sakamai, are using rice which was grown in the U.S. Nøgne Ø currently makes a Junmai, Junmai Ginjo, Yamahai Motoshibori, and Sparkling Sake. The Nøgne Ø Yamahai Muroka Junmai is made from 100% Ginpu rice, which has been polished down to 68%. They use a foamless yeast, #701, in the fermentation process. The Sake has a 16% ABV, an acidity of 2.4 (which is very high for Sake! ), and a Sake Meter Value of +3 (which is almost neutral between sweet & dry). As it is a Muroka, that means the Sake was not filtered and it was only pasteurized once (which means it technically could be a Namazake). The writing and linework on the dark-colored label, as you can see at the top of this post, is very light so the label doesn't stand out on a store shelf. It isn't eye-catching so the average consumer isn't likely to pick up the bottle to check it out. I think a bolder label, which could be symbolic of the bolder flavors found in their Sake, would be more attractive to consumers. However, the most important question is: how does it taste? First, the color has a slight greenish-yellow tinge, likely due to the fact that is is unfiltered. On the nose, there are appealing and mild stone fruit notes. Taking a taste, you immediately notice its rich mouthfeel, a full bodied Sake with good acidity and flavors of pear and melon, with a lengthy and satisfying finish. 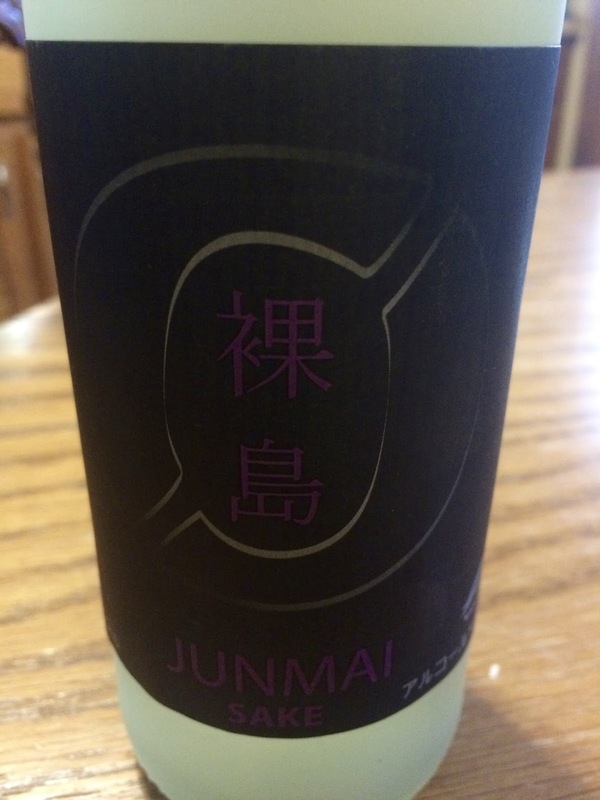 Unlike some other Yamahai, it doesn't possess a gamey/earthy element, though it does have that high acidity. That gamey/earthy aspect is very common with Yamahai, but isn't found in all such Sakes and this isn't the first time I have tasted one of those exceptions. This is also a Sake with strong umami and would pair well with numerous foods. Because of its clean and fruity flavors, it would go well with seafood, from sushi to oysters, but with its high acidity and umami, it could also stand up to heartier dishes, from burgers to pizza. It would be killer with mushroom dishes. I initially enjoyed some of this Junmai with Shepherd's Pie, fine comfort food which worked with the Sake, and I've also paired it with Cheeseburgers, and that was a fine combo as well. I'm impressed with the taste of the Nøgne Ø Junmai and am even more eager to taste the rest of their Sakes. Are there "Teflon" restaurants, places where negative reviews and negative press seem to have little, if any, effect on the popularity of these places? If so, is it even worth criticizing such places when it will have so little effect? Many large chain restaurants, from Applebee's to the Olive Garden, seem to be essentially teflon. It seems unlikely that people go to sites like Yelp or Trip Advisor to check the reviews on places like these. You already know what you will find at these restaurants. Their relative consistency is considered one of their advantages in some circles. These restaurants stay busy, despite any negative reviews they might receive. Despite any controversy over the alleged "Italian" cuisine at the Olive Garden, plenty of people still go there for the unlimited bread sticks and salad. It probably would take something on a massive scale to get people to stay away from these restaurants, like a huge mass of food poisoning. Legal Sea Foods seems to be another teflon restaurant. Their restaurants are usually busy, despite any negative reviews or controversy. Legal actually courts controversy at times, trying to be provocative, sometimes with their ads and sometimes with the dinners they hold. They recently ran a couple of ads, using Donald Trump and Hilary Clinton, and a number of people alleged that the Clinton ad was sexist. Some people stated that, due to this ad, they would boycott the restaurant and never dine there again. This certainly isn't the first time I have heard similar sentiments. However, it doesn't seem that any of this controversy has effected the bottom line of Legal. There still are plenty of people willing to dine and drink at the various Legal restaurants. And if people check out Yelp and Trip Advisor to learn more about Legal, they are highly unlikely to see anything about any of these controversies. And how many tourists coming to Boston actually care about such controversies? They simply want to enjoy some clam chowder, lobster and other New England seafood dishes. So what does it accomplish to criticize such teflon restaurants? It might give you some piece of mind for taking a stand, but it's unlikely to accomplish anything concrete against such a restaurant. So is it even worth making the effort to criticize them? If you want to do something significant, beyond simply soothing your piece of mind, it would take much more action. It would take effort to organize others, to create a large movement of similarly minded individuals, to have the power to impact these teflon restaurants. And for most people, they just are not willing to go that far. So, these teflon restaurants will continue to thrive, letting negative reviews and controversy slide off their teflon skin. It's fascinating to realize that the largest Japanese population outside of their country is located in Brazil. After Japan and Brazil signed a treaty in 1907, permitting Japanese immigration, about arrival 800 Japanese, many of them farmers, arrived the next year by ship, aboard the Kasato Maru. A significant number of the immigrants obtained jobs working on or even owning coffee plantations. After World War I, there was a large boom in Japanese immigration to Brazil, most settling in São Paulo, the location of the majority of coffee plantations. From the start, the immigrants brought food from Japan, and likely Sake, with them and soon enough, these items could be imported into Brazil. There is some indication that at least by the early 1920s, there were Japanese brewers in Brazil who were producing Sake, miso, and soy sauce. However, the only producer of note appears to be Tozan Farm, possibly because of the difficulty of brewing Sake in the heat of Brazil, the same type of problems that caed Sake brewers in Hawaii. However, though brewers in Hawaii eventually adjusted to the climate, it doesn't seem brewers in Brazil were as innovative. I should also note that Sake in Brazil is sometimes referred to as "Saquê." The farm, which would later be renamed Tozan, was located in the province of Campinas outside São Paulo and originally was owned, in the early 19th century, by Floriano de Camargo Peneado and primarily grew sugarcane. In 1854, his son took over the farm, expanding it to include corn, rice, and coffee, with coffee taking on a more prominent role in the coming years. In 1927, the Iwasaki family purchased the farm, renaming it "Tozan," which means "Eastern Mountain." In addition, "Tozan" was a pseudonym for Mitsubishi founder, Yataro Iwasaki, and his hobby of poetry writing. Hisaya Iwasaki, the third president of Mitsubishi and son of the founder, took over control of the Tozan Farm. In 1934, they started a Sake brewery. and their first Sake brands were Azuma Kirin and Azuma Otori. In 1975, Kirin Holdings acquired a portion of the Tozan company and their holding company became known as Azuma Kirin, mostly responsible for Sake production. At some point, Kirin Holdings owned 89% of Tozan, the rest owned by Toru Iwasaki, the great-grandson of the founder of the company. In July 2016, Kirin Holdings purchased the outstanding shares owned by Iwasaki and they now control 100% of the Tozan company. They have now combined Tozan and Azuma into a single entity, Azuma Kirin Company. Azuma and Tozan currently produce approximately 65 products, including Sake and Japanese food products, with Sake accounting for 35% of their business. It is also alleged that their Sake constitutes about 70% of the market in Brazil, making them the top Sake brewery in Brazil. Kirin will now modernize their Sake distillery, release a new logo for the Sake brand, and engage in a new marketing campaign. Information on other Sake breweries in Brazil isn't easy to find, and most that exist seem to have been started within the last ten years. Maybe the second largest Sake brewery in Brazil is Sakeria Thikara, which was established in January 2009 by Paolo Busch in the city of Piedade, São Paulo. The term "Thikara" essentially means strength and the brewery embraces an ancient Japanese legend of the Koi, Japanese carp, and this there is a carp on their bottles. They produce two brands, the Gold and Silver (including a Kosher variety), which are both Honjozo, and use imported Japanese rice. Honjozo means that they add some distilled alcohol to the Sake to draw out certain aromas and flavors. The Sake is available in a 745ml bottle, 187ml bottle, and a 5 liter box. They sell their Sake in Brazil and also export to a few other South American countries. The Destillaria Stoliskoff, which was established in 2007 in the city of São Roque, São Paulo, produces a variety of spirits including rum, whiskey and vodka. They also make two Sake products, the Sake Fuji and the Sakerita. Their website has very little information about the Sake Fuji, so it is unclear whether it is a premium Sake or futsu-shu. The Sakerita, which only has a 7% ABV, blends their Sake Fuji with tropical fruits, and three versions are available: Pineapple, Kiwi and Strawberry. If anyone has any additional information about Sake in Brazil, please contact me. Thanks. Kanpai! Here is another short list of some of the interesting Sake articles that have been published lately. It is great to see more and more coverage for Sake, though I recommend that anyone seeking to publish a Sake article check it at least a few times for accuracy. A few basic errors continue showing up in introductory Sake articles, and those errors would be easy to eliminate if you had a knowledgeable Sake person check your facts. Let us also hope that we see more than just introductory Sake articles in the future. 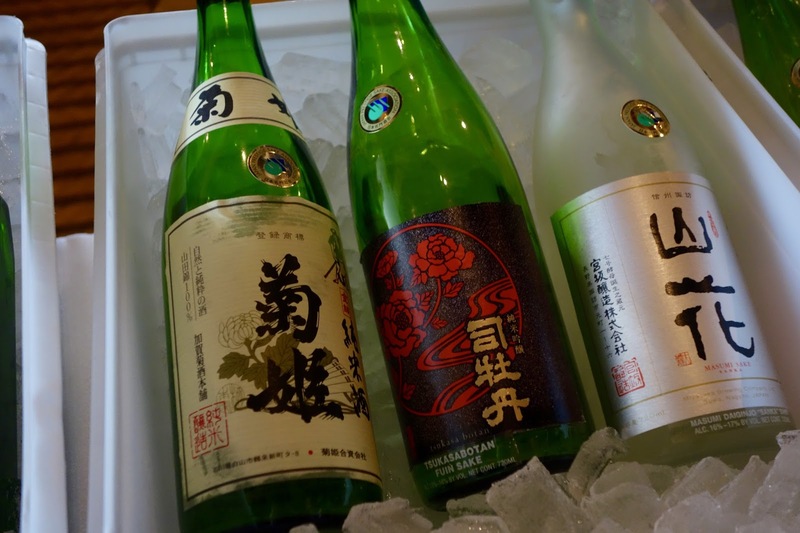 Sake has many depths and all those varied facets make great material for articles. 1) Want to taste and learn about Sake with me? On Wednesday, September 28, I will be presiding over two, one-hour Sake tastings (one at 6pm and the other at 7pm) at The Wine Press in Brookline. These tasting will be to commemorate World Sake Day, which is held every year on October 1. You will get to taste 6 Sakes, showcasing the diversity of this compelling Japanese beverage, with food pairings. I'll be talking about Sake, from its history to production, from its styles to its rituals, and will answer your Sake questions. The Wine Press is getting serious about Sake and I love to see their passion. Hope you will join me at one of these tastings. Space is very limited so get your FREE tickets now here at Eventbrite. 2) The production of Nigori Sake was illegal for hundreds of years until one brewery convinced the Japanese government to allow them to produce it, finding a way to make Nigori but still fit within the law. The Nikkei Asian Review recently published a a fascinating article about the Tsukino Katsura brewery in Kyoto and Tokubee Masada, its 14th generation owner. It was Masuda's father who convinced the government to permit them to produce Nigori in the 1960s, opening the gates for other Sake breweries to do the same. Masada is also the Chairman of the Global Strategy Commission of the Japan Sake and Shochu Makers Association, helping to plan a strategy to increase Sake consumption across the world. Check out this article for some intriguing insights into the Sake industry and this innovative brewery. 3) Tax-free Sake for tourists? The Japan Times reported that the Japan Tourism Agency has plans to seek an exemption from the Finance Minstry for domestically produced alcohol, including Sake, rom the liquor tax when they are bought by foreign tourists. This exemption would also include wine, beer, whiskey, shochu and more. These would essentially become duty free, and you could only buy them to take with you when you left Japan. For a 720ml bottle of Sake, the liquor tax is about 83 cents, so it would be most beneficial if you were buying a large amount of Sake. However, adding Sake to the duty free stores might make them seem to be even less expensive than what you might actually save. 4) Cartoons used to promote Sake? Back in 2007, Disney wanted to place Remy, the rat-chef from the animated movie Ratatouille, on a wine label. However, Disney canceled those plans as they faced lots of opposition, with a primary complaint that having a cartoon on a wine label might promote underage drinking. Japan has a very different mindset than the U.S. concerning animation, known as anime in Japan. Many adults in Japan embrace anime and it certainly is not seen as only for children. As such, they have no problems with using anime to promote adult products, which now includes Sake. Dig Japan reported that AltPlus, a game development company, has been "Working together with breweries and illustrators, they’ve created characters collectively known as ShuShu. They are personifications of various nihonshu brands. The character’s birthplace is the location of that particular brewery, and their age corresponds either to the foundation of the brewery or to the history of a particular nihonshu. They also list the characters' favorite foods, which are those that go best with the nihonshu the represent. Of course, each character has their own throughout back story." The article provides the compelling artwork for 12 of the characters, and gives detailed info about three of them. I think it is a fascinating promotion and I love the artwork. You can check out the official site for these anime characters, Japanese Sake Stories, but it is only in Japanese. I'm not sure these labels would ever be approved for the U.S. as there would be much opposition, alleging the labels could lead to underage drinking. Malbec is the signature red grape of Argentina, and the grape which has brought much fame to the region. Known by numerous other names, such as Auxerrois, Côt Noir and Pressac, Malbec was first introduced into Argentina in the mid-19th century, prior to phyollexera. The cuttings came from the Bordeaux region of France, not Cahors, the French region most known for its Malbec. Argentina possesses plenty of old vines of Malbec, including some over 100 years old. It is currently their most planted grape, and there are about 22 recognized clones of Malbec. Malbec can often be characterized as having an intense dark color, aromas and flavors of cherry, plum and strawberry, and soft tannins. However, Malbec is not a singular grape, and can express itself in many different profiles, especially due to terroir. Malbec has the potential to age well, and pairs well with meats, pastas, pizza, and other foods. Until the early 1990s, Argentina mainly used Malbec as a blending grape, but then they began creating single varietal wines, discovering its great potential. Numerous low cost Malbec wines started to get exported and wine consumers embraced them, helping to put Argentina on the international wine map. Wineries have started to concentrate on terroir, a sense of place, in producing their Malbecs. They have found that Malbec presents many different expressions dependent upon the terroir. Some wineries, like Altos Las Hormigas, feel the soil is the most important element of Malbec terroir while others, like Bodega Catena Zapata, feel that altitude is the key. Experimentation and research continue into this issue, and it is the future of the wines of Argentina. Though you will continue to find inexpensive Malbec wines, you will begin to see more and more higher-end Malbecs, those indicative of terroir. The Antigal Winery & Estates is located in Russell, Maipú, the site of a historic winery that dates back to 1897. Founded by the Peiro family, they bought vineyards in the Tupungato region of the Uco Valley. Antigal possesses a state-of-the-art facility, with a gravity-flow platform system and the capacity to produce 1.2 million liters of wine. The winery has both stainless steel tanks and concrete vats, the the concrete specifically designed for fermenting small amounts of wine so they can concentrate on specific representations of their grapes. I received a media sample of the 2013 Antigal Uno Malbec ($18), which is produced from 100% Malbec, has a 13.9% ABV, and spent 8-10 months in French and American oak. This was a dark and brooding wine, an elegantly muscular wine that yearns to join a hearty steak, grilled meats or even a hearty pasta dish. With a dark red color, the nose presents pleasing black fruit aromas, accented by mild spice and herbal notes. On the palate, it is big and bold, yet the velvety tannins are well integrated. There are rich and juicy flavors of ripe plum and blackberry with intriguing hints of spice and savory herbs. This isn't a simple and easy drinking Malbec but rather one with more import, a Malbec intended for food pairing. It is delicious, complex and reasonably priced for its quality. There's still time for some backyard grilling, and the 2013 Antigal Uno Malbec would serve you well. 1) This fall's New England Made Giftware & Specialty Food Show will take place at the Sturbridge Host Hotel in Sturbridge on Sunday, September 11 and Monday, September 12. Admission is complimentary for qualified buyers of wholesale giftware, specialty food or home furnishings. The New England Made Giftware & Specialty Food Show features unique, locally-made goods from over 100 businesses from Maine, New Hampshire, Vermont, Massachusetts, Rhode Island, and Connecticut. This fall's Show offers specialty gift and gourmet food retailers an entree into the wide world of artisanal merchandise produced in the region, including everything from quality jewelry to stationery to fine chocolate to maple syrup to leather goods to organic beauty products. "At New England Made, I really like that I don't have to question what country the products are made in. I'm usually meeting the owner of the exhibiting company and get to hear the story and inspiration behind each product," said Joyce Dossett, owner of Templeton country store The Kitchen Garden and a repeat NEM attendee. "This is important to me and my customers." An online retailer preview book featuring more than a hundred pages of stories and products by New England companies is now available at https://www.flipsnack.com/9E56F998B7A/new-england-made-buyer-preview-fall-2106.html. 2) On Wednesday, September 14, with dinner service starting at 5:30pm, Chef de Cuisine Michael Denk of Bar Boulud, Boston will be joined in the kitchen by Chef and restaurateur Daniel Boulud. The pair will collaborate for a one-night only “Après Summer” supper, featuring a final medley of summer ingredients and a seasonal preview of Chef Denk’s plans for the fall. Celebrating local sourcing and culinary traditions, the menu will include seasonal dishes. Bar Boulud’s sommelier, David Bérubé, will also be suggesting carefully sourced, exquisite wine pairings for each dish. Most importantly, this special dinner will allow guests the unique opportunity to meet both chefs and be amongst the first to experience these newly-penned dishes before they are officially added to the fall menu. 3) Chef Leo Asaro of Tico and Chef/Owner Rachel Miller Muzner of Mamaleh's will go head-to-head in Share Our Strength’s breakfast-themed Neighborhood Food Fight. Tico and Mamaleh's are set to face-off in round one of the Share Our Strength’s 4th Annual Food Fight Series on Tuesday, September 27, from 6pm-8pm, at Lincoln Tavern & Restaurant in South Boston. Chef Leo Asaro of Tico and Chef/Owner Rachel Miller Muzner of Mamaleh's will go head-to-head to win the title of "best breakfast." The "breakfast-off" competition will benefit Share Our Strength’s No Kid Hungry campaign, which aims to eradicate childhood hunger across the nation. Tickets cost $30 and include the food created by both talented chefs along with passed bites and two complimentary drinks. Tickets can be purchased at: http://ce.nokidhungry.org/events/boston-food-fights. 4) Respected local chocolatier Lee Napoli has been quietly conducting chocolate-making classes for the past several years in a hidden commercial kitchen, just off Dartmouth Street in the South End, at 23 Dartmouth Street (Rear). Her modest location, however, hasn’t stopped her classes from selling out. Word of mouth has been strong and far-reaching. The Fall/Winter 2016 class schedule is now available online. Enrollment is limited to 10 students per class, and dates fill quickly. Classes are held on alternate Saturdays from 2 to 4 PM and all materials and equipment are provided. The cost is $75 per person, including classroom time plus hands on participation. Best of all, each student goes home with a one pound box of candy they made themselves. To sign up, email chocoleechocolates@gmail.com. 5) On Tuesday, September 20, at 6:30pm, Legal Sea Foods in Park Square will host a wine dinner with selections from Gagliardo Barolo. Since 1948, The Gagliardo family has been deeply rooted in the history of cultivating grapes and producing wines in Piemonte, one of the most prestigious wine regions. Situated in northern Italy, the renowned vineyard’s approach is meticulously traditional with a focus on the environment and sustainability. 6) Beginning September 12, Terramia Ristorante in the North End is ridding diners of the “pick one” pasta struggle, with its new Monday Night Pasta Flight. Terramia’s Pasta Flight allows guests to mix and match any three delicious pastas off of its new flight menu for $25 per person. To make a reservation please call 617-523-3112. 7) Coda Restaurant Group, owners Michael Moxley and Jim Cochener, and the Canary Square team invites guests to join them for the New England Patriots’ kick-off game and indulge in an all-you-can eat buffet, drink specials, and much more. For the Patriots’ first game of the 2016-2017 season, on Sunday, September 11, Canary Square is throwing a delicious viewing party sure to satisfy those game-day munchies. In addition to it’s regular dinner service available until 11 p.m., Canary Square is offering guests an all-you-can-eat buffet for $18 from 6 p.m. until half-time and $10 buckets of High Life Ponies and Corona. Throughout the game, guests can also partake in patio games and a game-day wing challenge- if a guest is able to polish off a serving of Chef’s crazy, spicy wings, they will receive the wings complimentary and a restaurant gift card. The game, of course, will be broadcasted with sound on Canary’s multiple screens. This Saturday, September 10, from 12pm-5pm, the Sausage Fest is being held at the SoWa Power Station (540 Harrison Ave). There will be 5 food trucks and 6 craft beer/cideries celebrating sausage. Stoked Pizza will be making multiple options, including Spicy Calabrian Sausage and Peppers, and a veggie offering, while The Chubby Chickpea will be making shawarma spiced lamb sausages. Brewers include Two Roads, Lord Hobo, Coronado, Narragansett, Cidergeist, and Brooklyn Brewery. The event is free to attend, food and beer for sale a la carte, and there are a couple of advanced ticketing options which allow attendees to get additional perks. On Saturday, September 24, the second Tacos and Tequila will be held at Tavern Road from 2:30pm-5pm. Chef Louie DiBicarri's tacos will be paired with a variety of different tequila options for the attendee to sample. Last year's event had over 50 tequilas, and this one should have about the same. A ticket to this event includes tacos from Louie, and 12 tequila samples. Brands participating include Avion, Chinaco, Mescal Amaras Espadin, and Altos. In keeping with their spirits events, there will be a Tequila 101 class across the street at Drink from 1:15-2:15pm where attendees will learn about the different styles of tequila and have a base of knowledge to use at Tacos and Tequila. Cost is $45 for event & $75 for class. Rant: Sake Still Don't Need No Stinkin' Scores!